If you could re-invent the waterfront area in Boyne City what would it look like? Review the plans below to see the latest ideas the team from MSU have envisioned for Boyne City's waterfront based on months of community input. The Michigan Municipal League and Michigan State University School of Planning, Design, and Construction present this PlacePlan to Boyne City as a vision for improving its waterfront public space and a placemaking strategy to improving on the success of the downtown. The report includes a conceptual design for four distinct properties and connections between them, recommendations for policy updates that can support the design, and a discussion of funding opportunities. Below are links for both the written report and renderings. 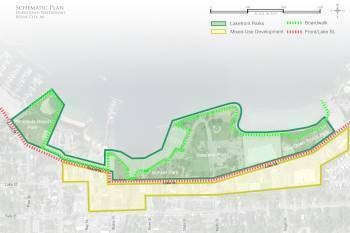 After reviewing all of the feedback from the August 27th presentation, members of the Michigan Municipal League and the team from Michigan State University Landscape and Architecture came up with the following draft proposal (click link below). After the presentation, attendees had the opportunity to have round table discussions and provide further input. For those not able to attend, we still want your input! Please review the draft plan and then by using the link provided, complete our survey. You may also provide input via email to the City of Boyne City that will be forwarded to the MSU team. Gathering a wide variety of community input is key to a successful plan that will represent a broad spectrum of citizens. Comments are due Oct. 7. The next steps in the process will include refining the designs based on the most recent feedback, presentation of the final design on Nov. 17 and a final report that will be completed in December or January. Now that you have viewed the plans...take the SURVEY. Approximately 70 community members came together on May 19th to share visions and suggestions for our waterfront. 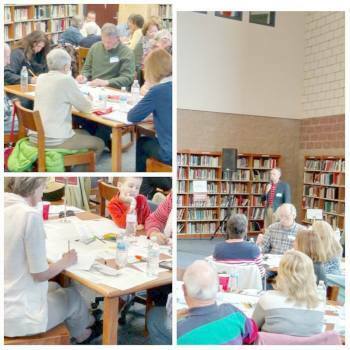 Using input from the May visioning session, the team from MSU will put those ideas into visual concepts that people can review and react to, then gathered additional public input at a August 27th meeting. Additional input and suggestions are vital to the project’s success. After keeping gathering comments both during and up to a few weeks after the August presentation, the team from MSU came back with refined ideas to present on Sept. 15th that were presented to the public and posted on the website for review. For those not able to attend meetings, the City posted plans and drawings on their website and to reach a wider audience, a survey was distributed through various media outlets to add one more way the public could engage in the process. The information and ideas from residents will be used to refine concepts that will hopefully become reality in time. In January, Boyne City was one of seven communities selected in Michigan to participate in “PlacePlans,” a statewide program that provides technical assistance with key economic development projects designed to attract and retain residents and employers. Boyne City’s project focuses on ways to improve the parks and public space along the waterfront, and better connect the waterfront with other community assets, like the downtown area. PlacePlans is a joint effort between the Michigan Municipal League (MML) and Michigan State University to help communities design and plan for transformative placemaking projects. PlacePlans are done with support from the Michigan State Housing Development Authority (MSHDA) and Governor Snyder’s MIplace Partnership. 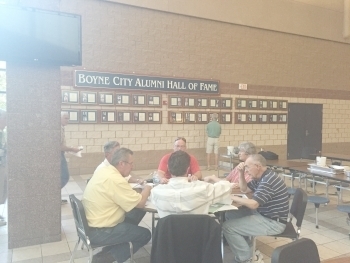 Information about PlacePlans, including the work being done in Boyne City, is available on the MML website or contact Matt Bach, director of media relations for the League, at mbach@mml.org and (734) 669-6317. The team from MSU will take back all of the ideas shared from all of the sessions and put them into something tangible. A report providing a working plan which is 100% community driven that the City can use as a tool to guide projects and assist with funding opportunities in the future.